3. Offpage Optimization (e.g. backlinks). To have your site appear higher in search engine rankings, the key is in properly chosen and targeted keywords. It can be one word, or a combination of a few words. However, it is not recommended to target too many words. The sequence of the words should be ordered according to their relevance. To help you find the right keywords there are some freeware tools, such as the Google Keyword Tool. On-page optimization covers a lot of methods that can directly be influenced by the site owner and editors while creating the pages of your site. AxCMS.net provides the following methods for on-page optimization. On the other hand off-page optimization is about factors that can’t be influenced by the site owner such as building up backlinks. At the page properties you can define the title of a page that will be shown in the browser and that is used by search engines. At the box GENERAL, you can define the title for each page within your site. It is recommended to use your selected keyword or keyword combination. The same keywords or combination of keywords should then be used again within your page. The recommended length of the page title (words or signs) varies for the different search engines, but generally it should not be too long. 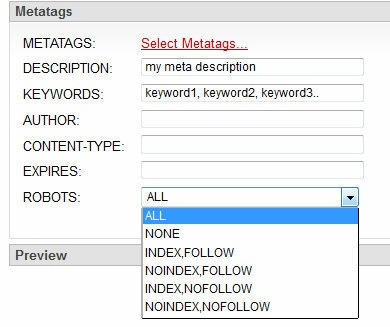 You can define an individual meta tag for each page or use meta tag groups. DESCRIPTION - useful for a short description of the page. It will be used by search engines for indexation and providing a summary of your page in the search results list under the link. KEYWORDS - useful for listing the keywords you want to associate the page with. It depends on the search engine how it will differentiate between the keywords, however it is often recommended to separate them with commas. If you want to add some meta-tags not present on Page editor, you can edit AxMetaTags control directly in the solution and include them as follows. In terms of SEO the definition of ALT (alternative) tags for images might not be that relevant. However, you can use the Alt tag for images to emphasize the keywords of your page. Besides, it is more userfriendly in case the image might not (or not yet) be shown. By using the keyword or combination of keywords in certain headline tags, the relevance of those keyword(s) is underlined. When your site has many pages with deep hierarchy, it is recommended to create a sitemap to help search engines with indexation of your site. A sitemap is an XML file describing the pages of your site in a certain format and which is located in the root directory of your site. To learn more about the format of the sitemap file, you can check the sitemap protocol page. You can create the sitemap manually, but for large amount of pages there are tools that help you in creating sitemaps, such as Google Sitemap Generator. before navigationRepeater.DataBind() method, and close them after it. URL Rewriting is used for providing more relevant looking URLs for pages and documents. It improves user-friendliness and search engine optimization. Refer to the article on URL Rewriting for more information.